“Halloween had its beginnings in an ancient, pre-Christian Celtic festival of the dead. The Celtic peoples, who were once found all over Europe, divided the year by four major holidays. According to their calendar, the year began on a day corresponding to November 1st on our present calendar. The date marked the beginning of winter. Since they were pastoral people, it was a time when cattle and sheep had to be moved to closer pastures and all livestock had to be secured for the winter months. Crops were harvested and stored. The date marked both an ending and a beginning in an eternal cycle. The Festivals of Fire were powerful and magical days where druids and shamans were predicting the future. This visionary attitude of the druid (council of kings and chiefs of the clan, judge and teacher, philosopher and astronomer, ceremonial and ritual priest) escorted to the versification of the bard have endured in the ‘Aisling’ musical themes of programatic music that accompanied the extensive bardic poems in a society where the written word did not exist for convenience, only the memory was worthy and allowed the survival of rituals and beliefs testimonied in stories of people like Taliesin, Finn McCumhaill and Amerghin, where the ability of the shamans transmutation allowed them to be part of many realities and stock. The ancestral legends have survived through the oral tradition of storytellers and sources of these was that of the monks of the VII Century of our era took on the task of rebuilding under the Christian sagas where the deities often pass through death, real and unreal are mixed in such a way that we dipped in a magical world. It is common on the ancient cultures of the oral tradition, which ensures a fidelity and permanence of memory much larger than the writing. The song is on top form to ensure that privileged. It is the ‘collective memory’ that transcends the territorial scope and enters the common tradition of the Celtic peoples until the boundary of the times. The only writing developed is known as’ Ogham ‘. Employed by the Vate Druids has 22 letters in yew wood sticks for divination and profiles of rock for signaling. The alphabet (mingled with the runic one) was divided into five groups representing the finger. Bards fulfilled the role of historians and genealogists official level, had inherited from their druid teachers the gift of evoking through words and music. Their instrument was the magic harp and Gaelic moods dominated the three forms: the ‘geantrai’ – cheerful music of the bronze strings – the ‘goltrai’ – the sorrow of the sliver strings – and the ‘suantrai’ – the melancholy of the steel strings -. These effects we even refer to the ‘ragas’ and the origin of the Indo-Celts. A specific case is the “pibroch” in Scotland, hypnotic musical style perfomed yesteryear by bagpipes in battle, which consists of variations on a theme with specific deletion of certain notes like the Indian ragas. These festivities still persist in different forms. The Shamain is now known by the famous Halloween. The 1st of May has become the modern observance of Beltane, and Christmas introduced by the early Christian Church has replaced the former observance of the Winter Solstice. Festival that celebrates the shortest day of the year and held as’ The Light of King Arthur” who as a Breton messiah is supposed to have been born in Tintagel by that date. The transition to the Winter is the time in which the mortal and the souls of the dead move freely within this and the Other World (simple transition of the real with the unreal, an area still passable for the living as references to the fantastic rescue songs and legends). Days of easy prediction for the Druids, the last breath of summer. Unlimited time of festivities, dance and celebration. Release time, the dispossession of fears and burdens, like the trees were stripped of leaves. News commented that there was already a belief that the human soul is immortal. Unlike the Pythagorean doctrine of reincarnation, the druidism has professed that the individual identity is extended into a new human body and so on in others. It also was not considered as punishment but as a pattern of existence. In fact many Celtic heroes are earthly representation of ancient gods. In many ways the mythical and ritual loses the link of the temporal world with the human spirit. Under the spell of Celtic storytellers, the transcending of the mundane and the impossible becomes true in a magical world. The point of encounter with the ‘Other World’ is manifold. Can be located in the middle ‘low’ in Ireland, in a country under the ground, or into the hills of fairies. It is also ‘the country under the wave’, an island or a series of islands under the sea. Those who transit through this world challeng the mundane times, in the morning everything disappears, and their homes re-located in future years. Thus the lives of men run parallel as the holy cycles of nature. The sacrifice of the New Year Mistletoe is celebrated on the 6th day of the moon by the Druid Orders like yesteryear. Even in winter, the perennial green mistletoe symbolizes the immortality of the human soul. In addition to creating talismans as the famous Egg’s Serpent, experts were also herbalists, picking ceremonial rites with other plants, in addition to the mistletoe, like verbena. In the spiritual plane of the early Celtic Christianity, the most outstanding feature is the asceticism practiced by monks and “saints”. The Celtic hermits pilgrimage to the most remote forests and lonely islands to gain salvation in their own way. Had an intimate affection for wildlife and nature, perhaps Christians parallels with the life of Francis of Assisi. Without a doubt we can conclude that the testimonies left by the Celts in their wake unveil them as a people with a unique identity and magic, good and distant in their early Mediterranean culture. Their ´personality, art, and environment conception show us a distinguishable soul from other peoples of antiquity. A heart forever Celtic. The music has evolved in this particular conception of the environment, turning with each annual cycle of thirteen months and thirteen moons, each month with its own deity and alphabet tree. It should be noted here that it is particularly difficult to find a Celtic melody that has a greater range to thirteen notes. These older calendar systems, based on the natural rhythms of the stars,have enabled the Celtic people to live in harmony with the pulse of nature. Each seasonal change is celebrated by a Festival of Fire in three days: before, during, and at the start of the season in question. The time is measured not by their nights and their days but dividing the calendar month and a half in a brilliant and half dark. The alternation of day and night, light and dark, says a fundamental duality, as the death of the night is interpreted as closer to another world that the light of day. A person who is born at night have the power to make contact with faerie people and wondering souls Many of them do not develop activities at night for fear of recognizing relatives and friends. The ancient beliefs say they should not be whistling on the outskirts of the houses or call the children by their own name. Many tunes, songs, films and legends and even make reference to the diminutive people, fairies, and characters from the mythical faerie world. It is worth nothing here that for the Celt world is too unpredictable and magic, governed by invisible and supernatural forces. Every rock, tree and river, has its spirits and strength of will associated with it. Highly superstitious, is quite careful with their environment, because they feared disruption to natural forces and even being captured by these descendants of ancient deities. The sites “on the limit” are also part of the magical Celtic cosmogony. Celtic people were considered barbaric by the Romans and pagans by modern Christianity, has lived fascinated by places such as coastlines, fords, or thresholds; sites that are neither one nor the other hand, going to be places of power. The shore is not even land or sea, it is still a combination of both, considering the land as representing our world and solid material, and the sea as representing the spiritual world. Another important ritual element is the ‘dew’, valuable for its virtue of prolonging beauty of those maids who bathe in it at dawn (not byday nor night), certainly is neither rain nor river, nor sea water or a well. Does not appear either from above or from the land. In the same way the aforementioned ‘mistletoe’, parasit plant that is neither shrub nor tree, and even more so grows from the ground. The ‘labyrinth’ is also considered as site of power and path through which pass the souls to the Other World. Passage through them does not lead anywhere in particular but in doing so there is always the chance of reaching the desired goal. In truth, the adventurers featured on the “travelling” legends usually arrive at their destination just after losing the track. Since the days when the Bardic Orders arose in Great Britain & Ireland, the Celtic soul has found its true expression in music. In the echoe of the old bagpipes, the magic sound of the Gaelic harp & evocative ballads, lies the heart of the Celtic tradition, its spirit and dreams Music, art that goes directly to the senses is charging a special energy when it flows from the instruments used by these people. Folk music ‘or’ world music , which simply acknowledge the Countries of the green and the wind, the sea cliffs of bristly, forests and mountains, clear land on whose soil megaliths stand as mute witnesses of a past still alive and whose reality is between history and legend. 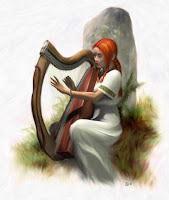 We can not say that the primary requirement is to be a Celtic descendant in order to perceive these feelings, just be ready to vibrate with this genre of music whose roots have led to several modern styles developed by the Celts at any place in the world. They recognize their influence on Bluegrass, the Progressive Folk, the Celto New Age, the Funky Fling, the Folk Rock, or the recent Afro Celt. Who ever predisposed to the deeply spiritual, melancholic, or mysterious, it has not associate the bagpipes are an enigmatic figure with a Highlander wandering the Highlands of Scotland at sunrise An ancient spell is entwined in their melodies which enchantment that immerses us in the spiral of Celtic folk dances or the melancholy of a song that tears at the tragic stories of people lived by a singular. There is a belief that the term ‘Celtic’ carries the notion of ‘mysticism’ and the special relationship disseminated by the lively musical ‘New Age’ with Celtic has unleashed a discussion about a genre ‘Celto-new age’ orinfluence of such migratory flows. Celtic people still keep dances today with a circular motion as a leader who sings interrogating axis from the center and the dancers answer around. A rock engraving (ca. 800 BC) near Cogul in Catalonia, described women dancing around a central male figure. The ancient Celts measurable spirals in their cosmogony, in wheels, the movement of stars, the rising and the twilight of the sun and the moon. These concepts reflected in the Celtic knots that populate rocks, miniature books and jewelry, symbolizing the creation and spinning of the stars in the sky. The ‘triskell’ three-pointed symbol of positive turn, is the representation of the sun and the cycle of life. Coincident with a belief in the reconciliation of three independent entities that involve the discovery of the point at which match domain Vates and heroes. You may find a magical tradition based on the beliefs and rituals of the shaman, the mystic tradition of the Unity, rooted in the spiritual philosophy of the pre-Christian Europe: a reverential worship of mother earth, the belief in an all-powerful life force that is part of living matter in the Universe, the role of man as guardian of life existing on Earth. Many Celtic dances are circular and some as the ‘reel’ in the opposite direction to rotate clockwise, something considered heretical by the then Queen Elizabeth of England, who ironically danced in his court were to somehow Celtic jig, immersed in a society that doesn’t conceive a schedule of thirteen months.